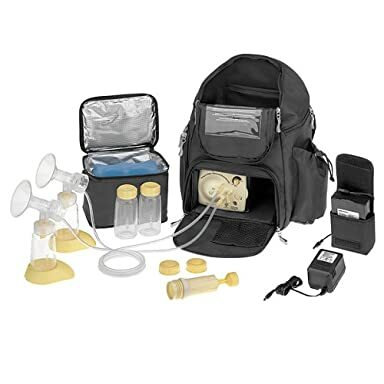 My friend, Courtney, recently posted about hands-free pumping. Admittedly, I had no clue how to pump beyond how to attach the shields to my breasts. "The Books" cover every minute detail of nursing, but they barely mention pumping, so I had asked Courtney how she pumped handsfree, and her advice helped a lot. During the past six months or so though I have modified her method slightly to work for me-- sans the handsfree pumping bra. I found a bra at Target that has support even when you pull down the cover (like you would to nurse). The "support" was enough to hold my breast shields while I pulled the cover back up, but before this, I would pump without a bra and use my legs to hold the shields in place. My recommendation for pumping-- splurge and buy the best pump you can afford. I am glad I went "all out" and bought the Medela Pump-in-Style Advance, which is available at places like Target and Babies R Us. I bought mine from the hospital to avoid paying sales tax. You can also rent these pumps from various pharmacies. Anyway, doing both breasts at once with an electric is efficient and helps me to stick with pumping. I was also able to purchase separately a power cord for use in Europe, which is exactly what I needed with going back and forth between countries! Now for the breastfeeding part. A couple that Kevin and I are friends with is expecting a baby, and they are planning on breastfeeding. I answered their questions as honestly as I could and promptly warned the wife that in the beginning, breastfeeding will hurt. I know the books say that it shouldn't, but let's face it. A small infant attaches with vigor much of the time. S/he is growing quickly and needs nourishment! I used the creme, but for the first 30 seconds or so after latching, I would squeeze my eyes shut and remind myself to breath! I am here to tell you-- BREASTFEEDING DOES HURT SOMETIMES! Screw the books and their description of "uncomfortable." I consulted with my midwife repeatedly, and she assured me (while watching me nurse) that The Boy was latching on properly, and that the pain was normal. Thank God for the Germans and their honesty! It certainly helped me to avoid the breastfeeding experience of Jen at Amazing Trips. Sure, she has triplets and an entirely unique experience, but I might have given up with the "support" she received! So there it is... my little ditty on breastfeeding and pumping. I'm happy to answer questions and openly discuss breastfeeding. I am proud to still be nursing my son at six and a half months with no definitive end in sight! Give me 6 months to a year and I guarantee you I will have bajillions of questions - the lady I nannied for in Tulsa wrote a book on pumping and swears by breastmilk for the whole first year, but got sick of (like you) the pain and time constraints imposed by nursing. With her second child she ONLY pumped. So between you and her hopefully I can figure it out, I really do want to try to keep it up for a year when the time comes. Thanks for the post! hey~!yeah for breastfeeding/pumping posts! i hope to nurse creighton until she gets tired of it, because i really enjoy it.